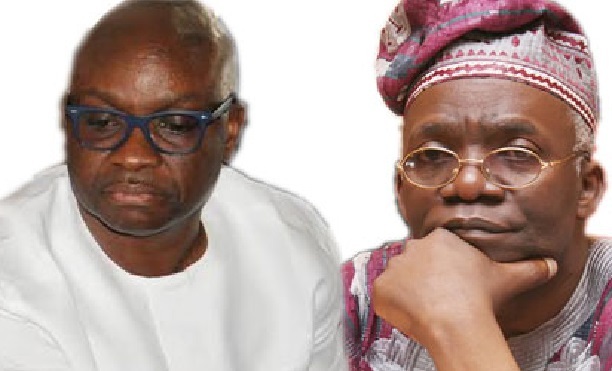 A Senior Advocate of Nigeria and Human Right Activist, Femi Falana has accused the Governor of Ekiti State and Peoples’ Democratic Party (PDP) presidential aspirant, Ayodele Fayose of cold-blooded murder. Falana, made thus statement while reacting to Fayose’s comment over an alleged Economic and Financial Crimes Commission (EFCC) seized property said to have been bought by him. He accused the governor of having a hand in the cold-blooded murder of Dr. Daramola and Tunde Omojola. It maybe recalled that Abubakara Malami, Attorney-General of the Federation, had insinuated during a senate probe that a Lagos lawyer bought one of the properties seized from pension thieves from the Economic and Financial Crimes Commission. Governor Fayose had latched on the claim to attack Falana, saying linking Falana to illegally-acquired properties seized by the EFCC is bad enough but the facts provided by Malami make the case against Falana even worse. “This must be the real reason why Falana always fall head over heels in defence of the EFCC and Magu, not minding the vicious violations of the constitutionally-guaranteed rights, freedoms, and liberties of citizens,” Fayose was quoted to have said. Fayose was also quoted to have advised the Federal Government to investigate Falana and not allow the matter be swept under the carpet over the property said to be located on Gana Street in Abuja, Nigeria’s federal capital. Falana has however denied buying any property from the EFCC. “I stand by my earlier defence that I never bought the house from the EFCC and I challenge him (Fayose) and the Attorney General to show the evidence. I challenge the garrulous Governor of Ekiti State to prove the monstrous allegation that I bought a house from the EFCC”, Falana said. Falana said since Mr. Ayo Fayose has not paid attention to the fact and circumstances of the case, he would advised him to study his explanation that the house in question is a subject matter of a pending suit before the Federal High Court and that the house has been forfeited to AMCON in the interim. “As of today, he has already forfeited six houses to the government of Nigeria. So, if he is sure that that this is proceeds of crime, he should apply to have it forfeited. He should contact the Attorney General, Mr. Malami, to apply to have the house forfeited, if they are sure that the house is proceeds of crime”, he added.